All of our wristbands are made from the highest quality materials. 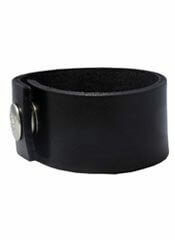 Black plain leather wristband with 1 1/4 inch wide snap. Made in the USA. 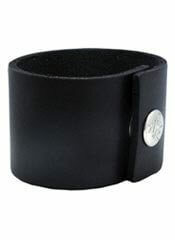 Plain black leather wristband, 1 3/4 inch wide with one snap. Made in the USA. 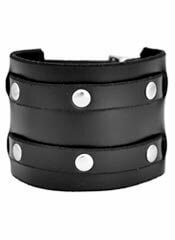 2 1/2 inch leather wristband with two rows of rivets and adjustable buckles. Made in the USA. 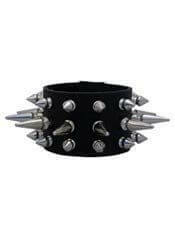 Black Leather Bracelet with 7 Claw Studs and a buckle enclosure. Made in the USA. 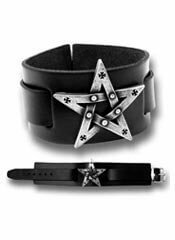 Black leather wristband with one large skull ornament. Made in the USA. Leather Watchband 2-1/2 Inch Wide 5/8 Inch Buckles Actual Watch Not Included. Hand crafted in the USA. 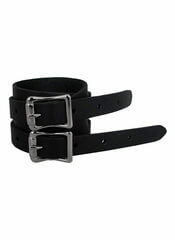 Leather Watchband with Eyelets 1-1/2 Inch Wide with 5/8 Inch Buckle. Made in the USA. 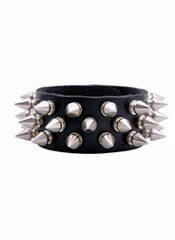 Leather wristband with spikes and grommets. 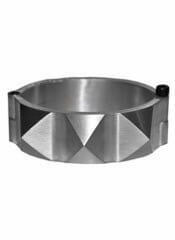 1.25" wide adjustable buckle fastener. Made in the USA. 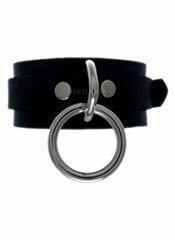 2 inch leather wristband with alternating grommets, rivets and snap closure. Made in the USA.